Zhengyi Jiang is a Senior Professor at the University of Wollongong, Australia. 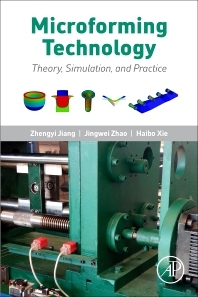 He is an expert in the area of materials processing and manufacturing, and is an experienced researcher in the theory, simulation and practice of microforming and micromanufacturing of metals. Jiang successfully established the first research area base on micromanufacturing and developed a world-class research group and research laboratory in micromanufacturing. He was awarded two prestigious Australia Research Council (ARC) 5-year Australian Research Fellowships (2008-2012, 2002-2006) to carry out breakthrough research on the quality control of thin strip in cold rolling. He has also been awarded an ARC Future Fellowship (Professorial level) (2012-2016) and two ARC Discovery Projects (2015-2017, 2010-2012), to conduct novel research on micromanufacturing. He has published 3 monographs, 5 edited books, 3 book chapters and over 460 peer-reviewed journal articles. Jingwei Zhao is a Research Fellow and supervisor of PhD students at the University of Wollongong, Australia, in the area of materials processing and manufacturing engineering. His main research interests include microforming and micromanufacturing of metallic materials, metal rolling technology, numerical modelling of manufacturing process, and tribology and mechanics in materials manufacturing. He has gained research experience in the field of materials processing and manufacturing engineering in work and study at universities in Australia, South Korea and China, and has been very actively involved in the manufacturing of many kinds of metal alloys. As a Chief Investigator, Zhao was awarded one ARC Discovery Project (2015-2017) in micromanufacturing. He has published 1 monograph, 2 edited books, 2 book chapters and over 100 research articles. Haibo Xie is an Associate Research Fellow at the University of Wollongong, Australia. He has been researching and teaching in the area of materials processing and manufacturing engineering since 1997. His main research interests are in manufacturing mechanics, performance modelling and process optimisation in micromanufacturing on metal and metallic matrix composite material. His research has integrated analytical and numerical simulation, and control and design methodologies to advance micromanufacturing processes. He has designed unique manufacturing equipment for micro flat rolling and cross wedge rolling. Xie has published over 40 articles and supervised Master of Engineering and PhD students in China and Australia.